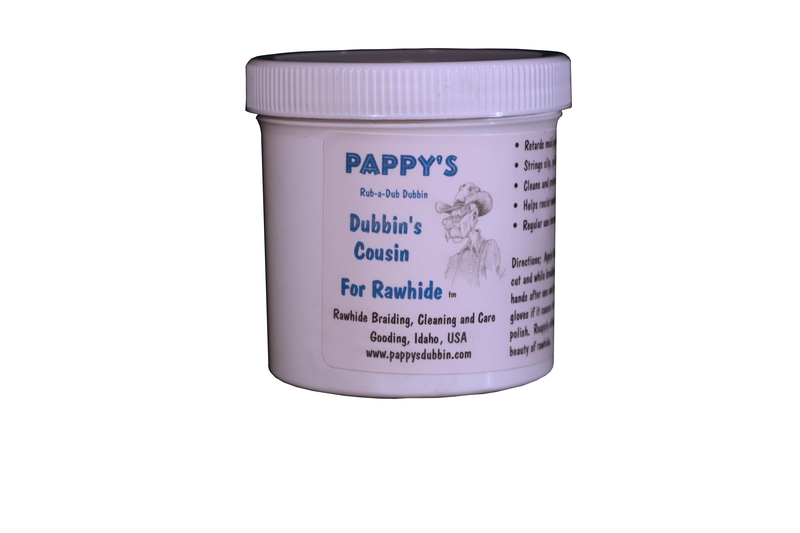 Pappy’s Dubbin’s Cousin (for Rawhide) is a soap product made especially for treating, cleaning, conditioning and braiding of rawhide. Rawhide is the skin or hide of an animal that has not been though the tannery process. It is twice the price of the other products because of the added steps required to produce this unique product. A rawhide braider may apply this generously to the strings after cutting them from wet rawhide and it may help reduce the mold growth until the job is finished. Some braiders apply it to dry rawhide for overnight casing, add more Dubbins Cousin with a little water the next day and braid. Braiders report the strings lay and stay flat and buff up pretty when the job is done. It has a higher PH and can be hard on hands so if you are in it for hours you might need to protect your hands. 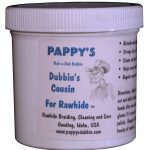 One rawhide braider customer said that I, Pappy, must be a genius for inventing it, and that it makes him look like a genius to his customers when he uses it. It works well to clean used rawhide equipment and often brings the used rawhide tack back to original beauty. Some customers also like what it does to leather. It will replace saddle soap for cleaning leather goods but for a more economical solution to cleaning leather we recommend Premium-Lite Dubbin for that. I recommend the 6 oz even though the 16 ounce is cheaper per ounce because of the price and it last a long time. Thank you for the payment!